Then Jesus came out wearing the crown of thorns and the purple robe. And Pilate said, "Look, here is the man!" When they saw him, the leading priests and Temple guards began shouting, "Crucify him! Crucify him!" "Take him yourselves and crucify him," Pilate said. "I find him not guilty." "Not guilty!" That's the true verdict on Jesus. However, he assumed our guilt and sin on the cross so that we can be freed from them. 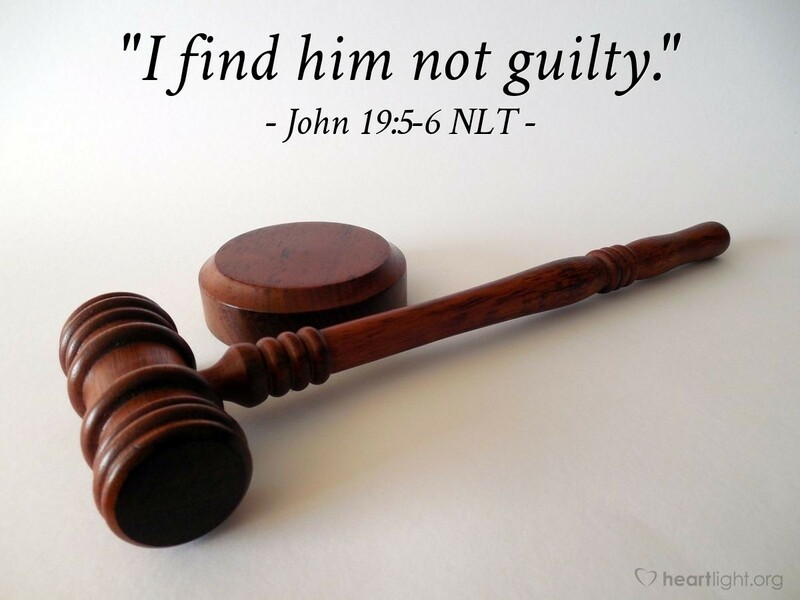 He died as a sacrifice for our sins and the sins of the whole world so that everyone who truly comes to him can be declared "not guilty" before God. Praise God for his incredible grace, and praise Jesus for his incredible sacrifice! Father, I praise you and your Son for the incredible gifts of forgiveness and freedom from sin that are mine through Jesus bearing my sins on the cross. May my life show that I appreciate this incredible gift and that I take sin seriously and commit to staying away from it. In Jesus' name, I pray. Amen.